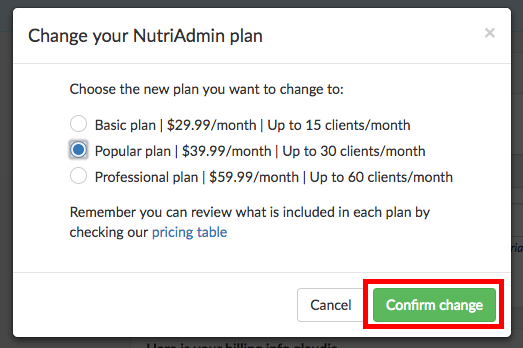 Here at NutriAdmin we offer different pricing plans to accommodate to varying business sizes. 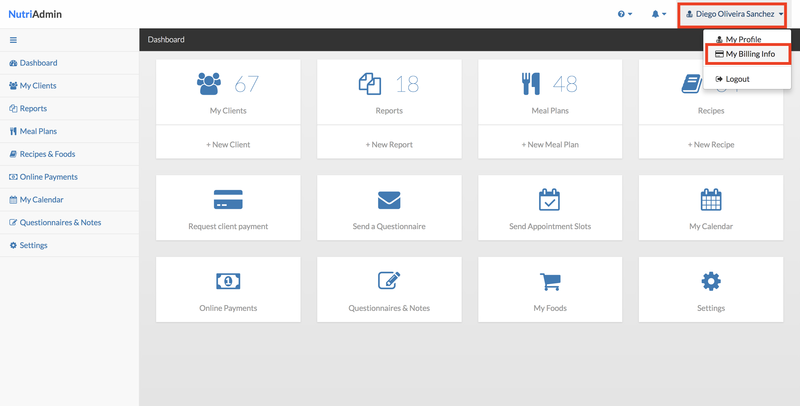 The main difference between the plans is the volume of clients they allow you to manage per month. Note: This article show you how to change your plan. If you want to cancel your subscription, please check this other article. Step 2: Click on your name on the top-right corner of the screen. Then, select My Billing Info. 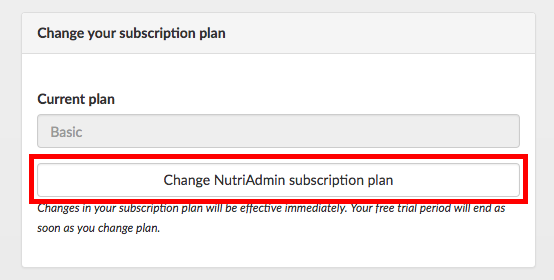 Step 3: Click on Change NutriAdmin subscription plan. Step 4: Click on Confirm change. Done. Your new subscription plan will be available immediately. Charges are prorated. This means that when you change your plan in the middle of a billing period, your next invoice will reflect a charge that takes into account the proportional cost and time of use of each plan involved in your previous month. E.g. if you spend 15 days in the basic plan ($29.99/month), and then change for another 15 days to the popular plan ($39.99/month), then you will be charged approximately $35/month (the amount in between). For more information, you can click here. It's possible for the charges to be spread unevenly during each billing cycle.